The L801 full color label printer, powered by Memjet technology, features industry-leading cost of ownership and a high-impact, full-color output at 60ft./minute, 8.5? width, and 1600 dpi resolution. The L801 color label printer is an industrial web-fed inkjet solution, which is ideal for short to mid-run inventory and product identification applications. The L801 is ideally-suited for bringing high-resolution, vibrant, full-color label printing to product identification applications. 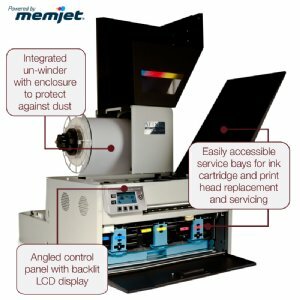 The L801’s Memjet technology allows for an ultra-low cost-of-ownership. The L801 has an integrated unwinder, holds 1.25 liters of ink to support large runs and has easy access doors for fast, simple media and ink replacement. An optional rewinder is also available. The L801 Color Label Printer from Afinia comes with Bartender. The Afinia L801 Color Label printer is compatible with a wide range of paper, polyester, polypropylene, and vinyl label stocks from major vendors such as MacTac, Fasson, Avery Dennison, and Wausau Coated. A comprehensive list of label stocks and providers supported by the Afinia L801 is available by request.